My first explanation of peacock power came from advanced teacher training. Guest teacher Alanna Kaivalya also has an adoration of this bird, and explained the deadly cobra’s only natural enemy is the peacock. (I’d originally guessed it was the weasel, a la Rikki Tikki Tavi, but apparently weasels are anti-snake in general, not specifically the poisonous king cobra.) Why is this fun fact of import? Well, in yogic tradition, the cobra symbolizes the fear of death. Thus, the sole natural enemy and conqueror of the fear of death is the peacock. HAH! Love it! When we overcome this fear we have limitless potential. Well, we have limitless potential even if we allow our fear to consume us; we just can’t act on it. The peacock acts as a visual reminder that fear need not triumph. We can consume fear as the peacock consumes the king cobra and be radiant as a result! Upon learning the peacock’s prominence in yogic tradition, I did some research to see if the fanciful peacock appeared anywhere on the Christian historic scene. Yepper. Good ol’ King Solomon came through for me. King Solomon in all his wisdom and wealth shipped in peacocks along with gold, silver and other valued imports (1 Kings 10:22). He selected the finest goods from all the lands to be brought to him, and the peacock was among them. That’s about all the Bible says on the peacock front, but historians tell us of the value imparted on this bird in multiple cultures. Did you know that in early Christianity, the peacock was a symbol of the resurrection of Christ? The Christian peacock symbolism arose because early legend told that peacock flesh did not decay. Thus, the peacock became the mascot of Christ’s resurrection because He too did not decay. He defeated death! Swaha! I didn’t know any of this for a long time, but I love how my natural proclivities for this bird have unearthed all these long standing cultural norms that engrain the peacock into spiritual practice. Our intuition is an amazing thing – truly a gift from God. Intuition is seated in the ajna chakra between our brow point, often referred to as our “third eye”. Peacock feathers all have an overt eye in their center which can remind us of our own inner eye of intuition. The peacock’s thousand eyes allow it to see the truth. It all flows together so perfectly. Knowing the meaning of the peacock symbol makes this bird that much more special to me. 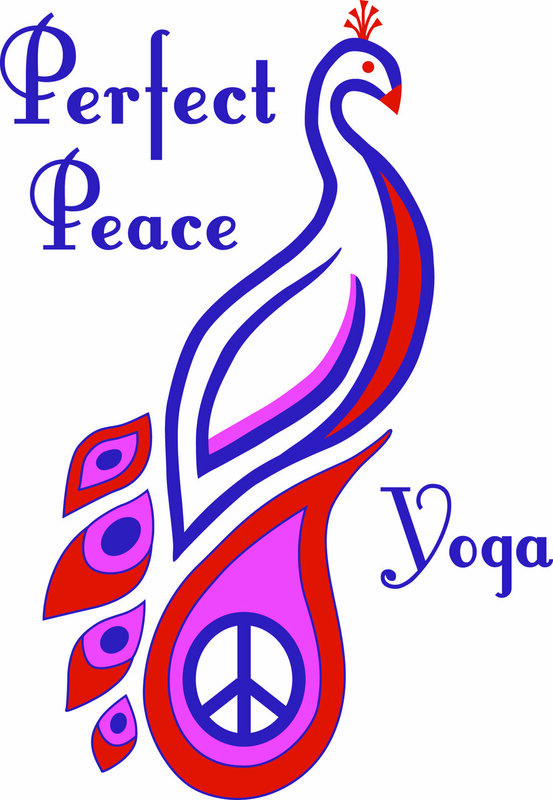 For all these reasons, I chose the peacock to be the logo of Perfect Peace Yoga. I hope you will enjoy your next peacock sighting more as well, and above all may you be granted peace.